This 2002 Tacoma was the most recent case of this phenomena. 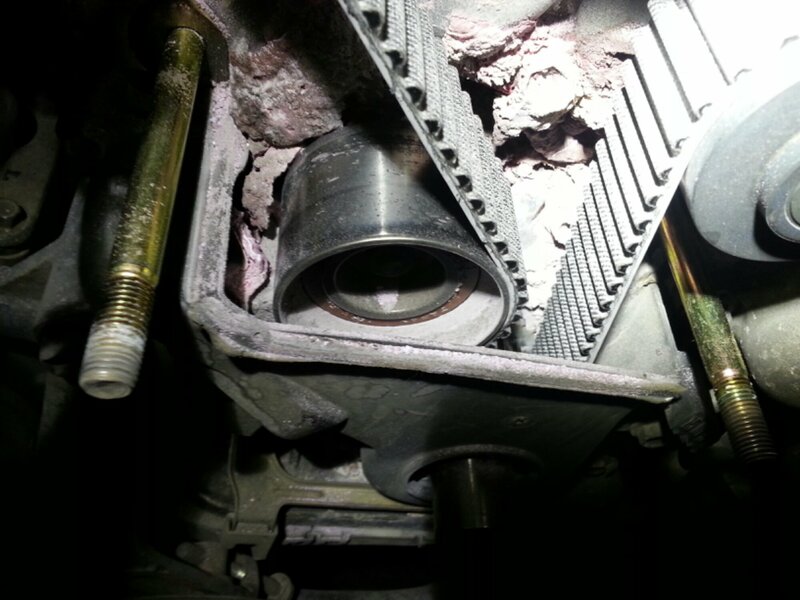 The vehicle came in with the performance complaint of no power and heavy exhaust smell. A quick scan brought up trouble codes for oxygen sensors and fuel control near limits. Idle was slightly rough but acceptable. The exhaust smelled rich which could be expected. Scan data ruled out plugged exhaust but showed that the computer was loosing a battle constantly trying to lean out a runaway mixture. Having seen this many times before I decided to inspect the lower timing cover for signs od coolant leakage or residue near the lower timing cover while pressurizing the radiator. This is the area where coolant makes its way out of the timing cover when the water pump leaks. This one looked clean. We detached the upper timing cover to examine the synchronization of the camshafts and crankshaft and what we saw confirmed our suspicion that the timing belt had skipped four teeth on one cam ans two on the other. Now, I should say that we see what we call “jumped time” often and that by itself does not a phenomenon make. However deeper behind the mid and lower covers lied the automotive equivalent of kidney stones or perhaps an artery jamming clot of cholesterol. The infamous Waldo in this case was an ever so slow coolant leak. Too slow to leave a mark on the garage floor, too slow to show up as anything more alarming than a quart top off at each oil change, and too slow to cause an overheat. These water pumps can leak so slow that the hot coolant that leaks out instantly evaporates on the hot engine surface insulated by the timing cover. When the moisture evaporates the residue left behind accumulates and forms shale like stones that eventually beak off of the surface and fall into the cogs and sprockets below forcing enough stretch in the timing belt to disengage the teeth and skip enough teeth to cause the whole problem. If the timing belt breaks or enough teeth are jumped at a high enough engine speed the motor will be destroyed. We can check this with a special snake spy camera that can view this area without having to disassemble the entire timing cover. When can I gent my 03 Tacoma in to have it checked for this?? ?